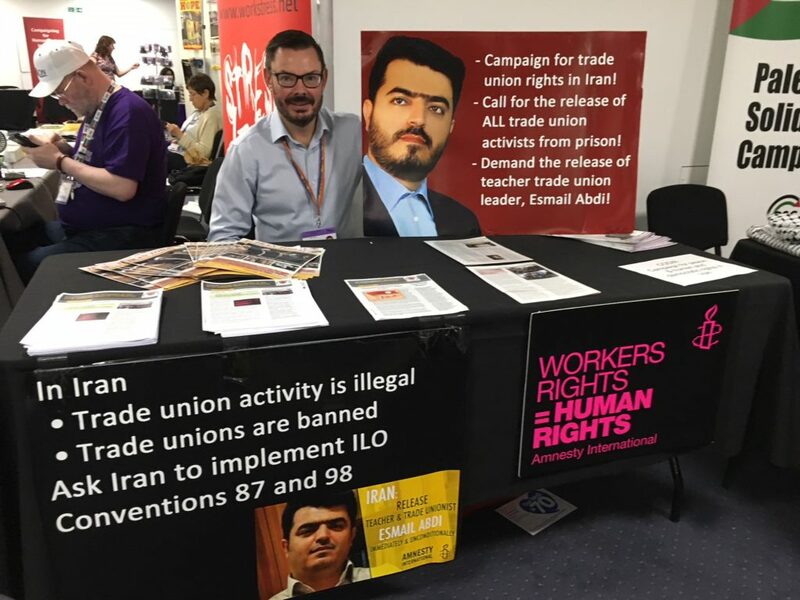 For the fourth year in a row, a CODIR delegation consisting of Jamshid Ahmadi, Assistant General Secretary; Liz Payne, Campaign Officer; and David Maguey, attended the UNISON National Delegate Conference and held a successful information stand at the Conference Centre. 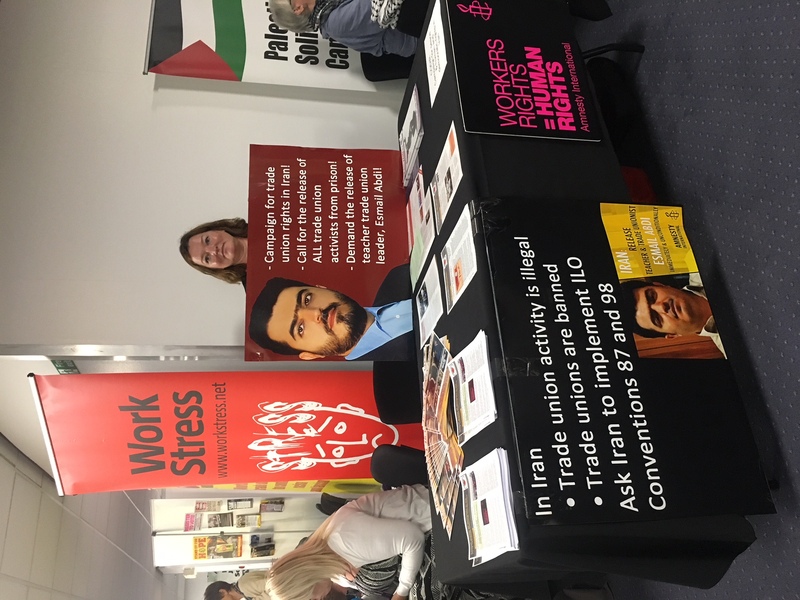 Hundreds of conference delegates were introduced to – and others reacquainted with – CODIRs long-running campaigns and our work received the praise and support of many who stopped by our stand. A specially produced leaflet, introducing CODIR and giving an overview of its work and some of its current campaigns, was distributed to thousands of conference delegates. 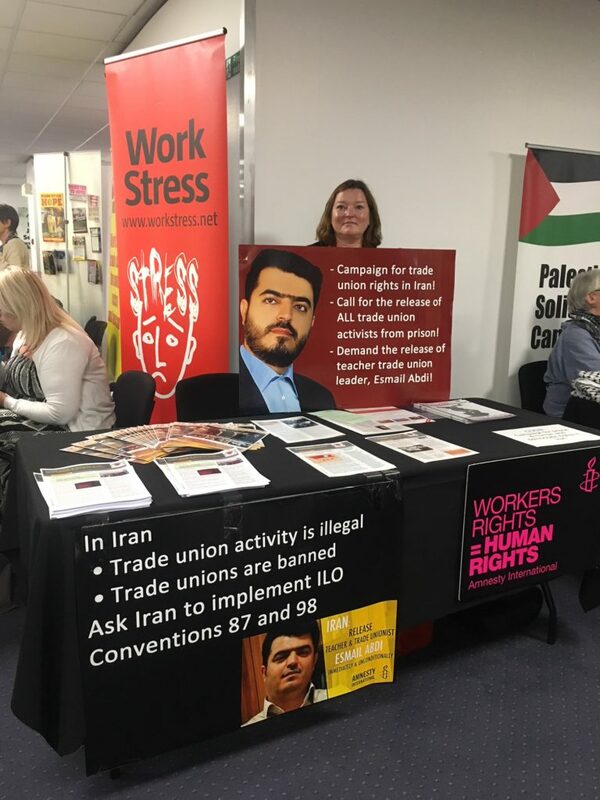 Accompanying the stand were banners and posters informing the delegates that trade unions are prohibited in Iran and that trade union rights go unrecognised there. The delegates were asked to question Iranian regime’s refusal to implement the ILO conventions including; no. 87, concerning Freedom of Association and Protection of the Right to Organise; and no. 98, concerning the Right to Organise and Collective Bargaining. 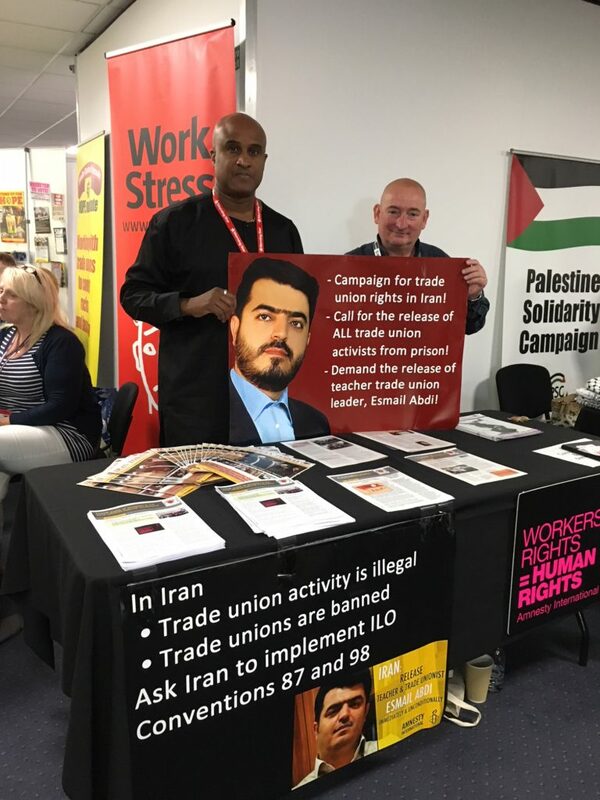 The focus of the campaigns promoted by CODIR this year was the release of all trade unionists jailed in Iran for engaging in trade union activities and defending the right of their members to fairer salaries and better conditions of service. Esmail Abdi, the leader of the Iranian Teachers Trade Association (ITTA), featured prominently in all activities. 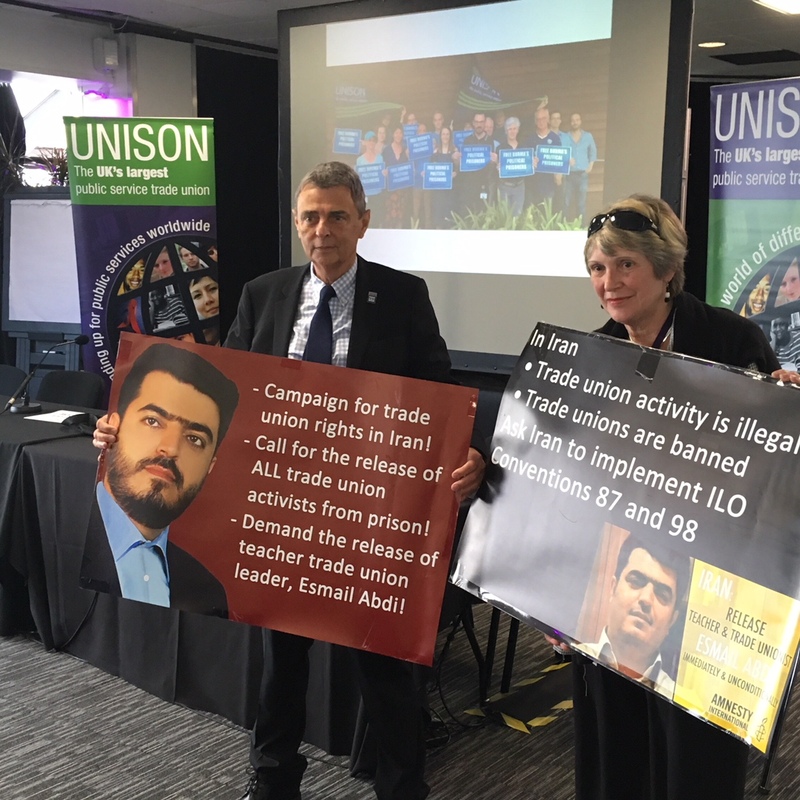 On Monday 18 June the delegation attended the conference’s international rally where Dave Prentis, General Secretary of UNISON, was joined by Liz Payne to highlight CODIRs campaign for human and democratic rights, including trade union rights, and for the release of Esmail Abdi. Throughout the following few days, hundreds of delegates visited the CODIR stand and expressed their support for our campaigns, including; Nick Crook, Head of the International Department of UNISON; Roger McKenzie, Assistant General Secretary of UNISON; Paul Glover, Chair of the International Committee of UNISON, as well as many others. A truly successful few days and another wonderful experience!